A bounty hunter is taking a guy to Santa Cruz to get his bounty. On the way he meets a woman and two guys who want to collect the bounty in order to get an amnesty and start their life afresh. Meanwhile the bounty's brother is coming to rescue him. 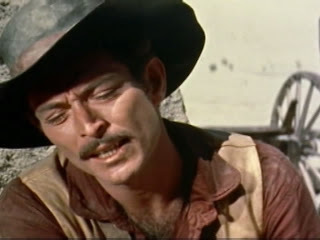 Sorry for the above picture, Lee Van Cleef doesn't play that big a part in the film but it was the best picture I could find, this not being a particularly famous film. The fact that it isn't famous shouldn't deter you form it, though. The thing is Ride Lonesome is a pretty good Western, short and sweet and giving James Coburn his screen debut. The cinemascope photography is put to great use here with some great landscapes and framing, this is clearly inspired by John Ford, with scenes of framing reminiscent of The Searchers. The best things about the film are probably the writing and the great ending. It has very natural dialogue, which is unfortunately let down by some of the actors who seem slightly stunted. Randolph Scott among them, James Coburn is the best actor playing a very secondary role. A good film, but nothing to write home about. The film plays a prominent role in "The Cursed Tuba Contingency", an episode of The Middleman.